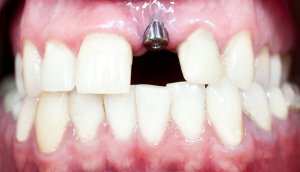 Whether you have a single missing tooth or need to replace several teeth, dental implants can be a great alternative to dentures. Your dentist roots dental implants into your jaw using a structure that functions like a tooth root, to create a natural result that doesn’t slip or require special care like dentures. Talk to your dentist serving St. Louis about whether dental implants are the right tooth restoration method for you. Here’s an overview of what you need to know about dental implants. Dental implants are artificial teeth. They consist of a post that is placed into your jaw to mimic a tooth root, an abutment, and a crown. The abutment is screwed onto the post and acts an anchor for the crown. Dentists can craft the crown to closely match the shape and color of your remaining teeth for a natural appearance. For patients, dental implants provide a long list of benefits over other tooth restoration methods. Because implants are placed directly into the jaw, there is no risk of a poor fit or slippage, as may occur with dentures. Dental implants don’t require any special care and can be brushed and flossed like your natural teeth. Because implants don’t rely on neighboring teeth for support, as bridges do, they don’t damage healthy teeth. Getting dental implants used to require multiple appointments and take six months or longer. With same day dental implants, your dentist can complete the entire procedure in a single office visit, which saves you both time and money. Same day dental implants offer the same great benefits as traditional implants in a fraction of the time, meaning you could be one dentist visit away from restoring your beautiful smile.